I had another financially-related freakout this afternoon. A little free time at work afforded me the opportunity to do something I have long procrastinated doing: shopping around for health insurance. Freelance producing is nice work if you can get it—and I am very thankful to be employed—but one of the major costs of any freelance work is having to pay for your health insurance. Adding insult to my non-existent injury, the options for remotely decent health insurance at a reasonable cost are few. I compared five plans and did the requisite calculations. So many digits! My eyes are exhausted from popping out of their sockets. I avoided making any decisions, electing instead to ponder my dinner—and I needed a dinner to be excited about. It’s been a long week, and I’ve behaved very well with my diet. I didn’t want to blow all that effort, but I wanted to eat something other than fruit and Greek yogurt. I’m getting really tired of non-fat Greek yogurt. I looked through my basket of old issues of Cooking Light, and found a potential dinner on the cover of the September issue, 2011: the creamiest-ever mac & cheese. I’ve never made mac & cheese myself, but I know what the real thing tastes like. I’ve had it once—just once. I watched my friend Pam make it for Easter years ago. I remember a towering heap of shredded cheddar cheese, a carton of half & half, and (at least) a half pound of butter. I remember the bubbling goo at the edge of the pan, the crispy tips of the slightly charred ziti, and each piece underneath coated with just the right amount of cheese, buttery sauce. I also remember a lot of bad mac & cheese. And I’m not talking about the stuff from the box. I have a soft spot for the nuclear-orange stovetop mac & cheese that I prepared on a two burner stove in college, while the pre-fab fish sticks crisped in the shoebox-sized oven below. 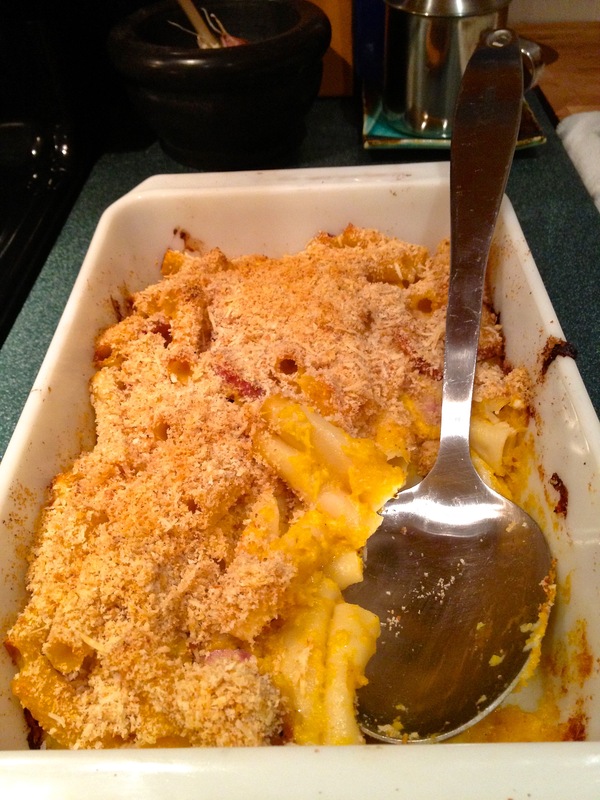 I haven’t eaten boxed mac & cheese in over ten years, but in that time I’ve had lots of bad baked mac & cheese. It’s a mainstay at catered parties, hospital cafeterias, and at video shoots (on the rare chance hot food is provided). You know the kind—It’s in a giant aluminum pan that’s been perched atop a sterno for 8 hours at a minimum. 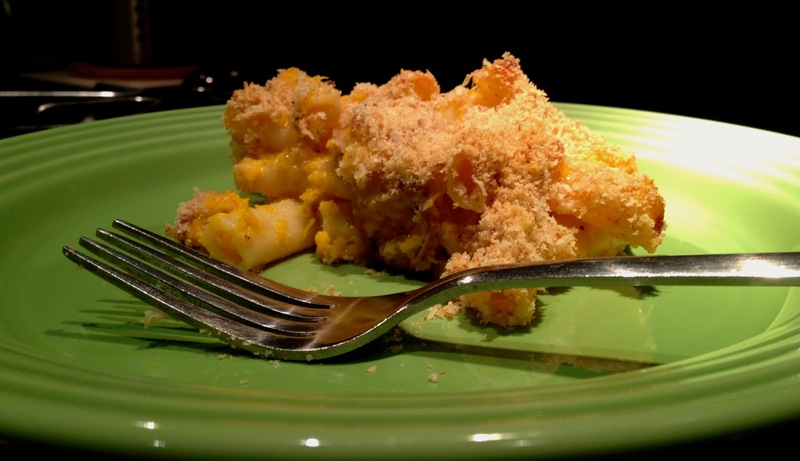 And you know that because the macaroni falls apart as you spoon it onto your plate. The sauce is the right color, but it’s thin and watery. And something that may have once been cheese clings to the macaroni like the last bits of yogurt at the bottom of a plastic cup. Not exactly “Mmm, mmm…good!”, is it? So you can imagine how, in spite of my excitement over the sight of mac & cheese on a magazine cover, I was dubious about Cooking Light’s claim that this recipe was the “creamiest-ever”. While I have my doubts about makeovers of traditionally decadent, calorie-loaded food (and with good reason—light ice cream is light years from the real thing), I had a good feeling about this recipe. The base of the cheese sauce is not actually butter or bechamel, but butternut squash, cooked with milk and chicken stock, then pureed. You obviously can’t claim the title of “creamiest-ever mac & cheese” without cheese, and this recipe called for a good amount of gruyere, romano, and parmesan. I had all those, plus some leftover shredded cheddar from the chili I made last week. The trick to making a lightened up version of a heavy dish is to keep your expectations in check. A sauce made with butternut squash, milk, yogurt and a limited amount of shredded cheese is not going to taste like one made with butter, cream, and massive amounts of cheddar. All you can hope is that what you ultimately make tastes good, if not very good, and that the calories you’ve saved will be spent on the day when nothing but the real thing will do. So here’s the recipe. I made half, and followed the instructions pretty closely, BUT I added two ingredients to amp up the flavor of the sauce: old bay seasoning and smoked chicken sausage, which I happened to have in the fridge. The verdict: Yes, the sauce is most definitely creamy. But if I were me two hours ago, I would have added more cheese. Do that, and you’ve got yourself a better-than-good—dare I say, damn fine—dinner on the table. 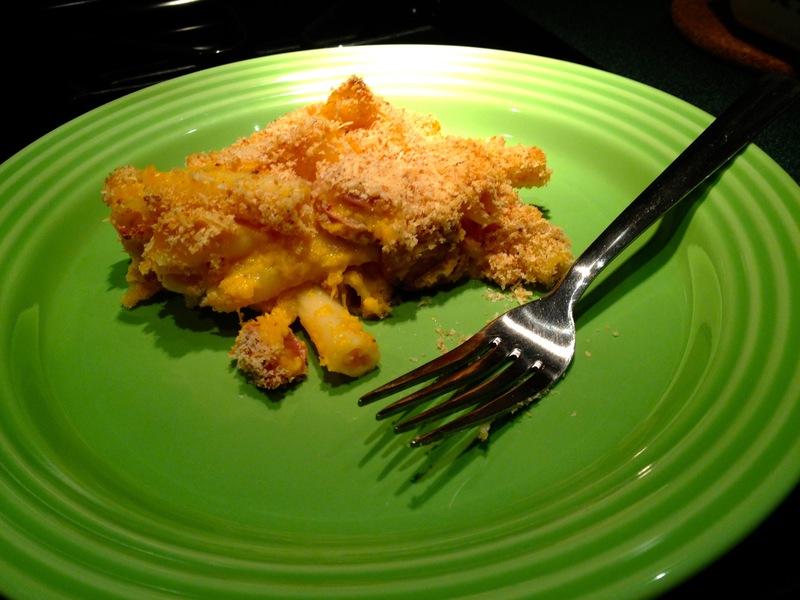 This entry was posted in Musings, Savory, Tips and tagged butternut squash, cheese, cooking light, dinner, easy, light, mac & cheese, macaroni and cheese, mains, photos, recipe makeover. Bookmark the permalink.